Sawadee-krub. Hello from Thailand, where we’ve spent a day driving the new Honda Accord. Launched here at the Bangkok International Motor Show earlier this year, the ninth-generation Honda Accord will make its official debut in Malaysia next week, as you would have already found out. UPDATE: The 2013 Honda Accord has been officially launched in Malaysia – click to read our launch report with local specs and pricing. 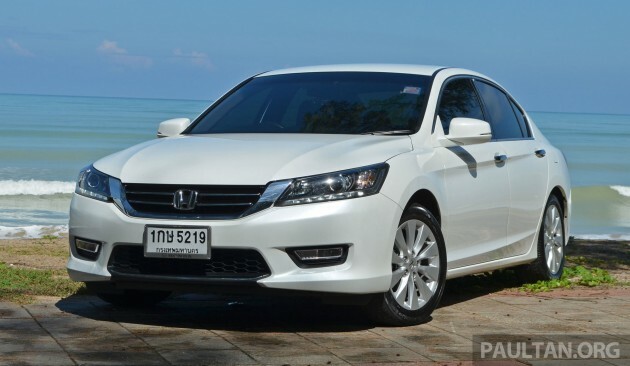 This first drive report will be based on the Thai-made, Thai-spec Accord, which is identical to what we will get in Malaysia, save for slight spec and trim differences. Malaysian Accords will roll out from Honda’s Melaka plant as a CKD model in three variants – 2.0 VTi, 2.0 VTi-L and the range topping 2.4 VTi-L. The previous two Accords were launched in Malaysia with a V6 option, but there will be no six-pot this time around. If you’re wondering, no, this is not a facelift but an all-new generation of Honda’s famous Accord lineage. The eighth-gen Accord that we’re familiar with has been around since 2007, and since then, a raft of rivals have emerged in the D-segment. In that time, Toyota came out with a new Camry, Nissan finally brought the Teana into Malaysia, Mazda launched two generations of the 6, while an awakened South Korea rolled out eye-catching entries like the Sonata and Optima K5. We even now have some European alternatives in the shape of the VW Passat, Peugeot 508 and Ford Mondeo. It’s a brave new world, and the new Accord has its work cut out. If the new Accord looks smaller, your eyes are correct. At 4,870 mm long, it is 80 mm shorter than the outgoing car, and its wheelbase length of 2,775 mm is 25 mm less than before. Coupled to the fact that it’s slightly wider and lower, the new Accord looks fitter and more athletic in the metal. It is by no means a small car, not when it replaces a sedan that’s bigger than the class norm. In any case, despite the reduction in outer dimensions, the already limo-like rear legroom is up by 35.5 mm, and the vast boot holds 23 litres more, thanks to packaging magic. Honda adds that overall weight has been reduced by 4.5%, which makes it win-win for all aspects – smaller body, more space, less weight. Under the hood, the 2.0 litre SOHC i-VTEC engine has been carried over, but is now tuned for better fuel efficiency. The Thai-spec sheet reads 155 PS and 190 Nm, which is more (+ 1 Nm) or less (- 1 PS) similar to what our eighth-gen 2.0 made. Also unchanged is the five-speed automatic transmission. The 2.4 is new. Out goes the long-serving K24A DOHC i-VTEC unit, replaced by a brand new “Earth Dreams Technology” engine. The new twin-cam i-VTEC mill is good for 175 hp at 6,200 rpm and 225 Nm of torque at 4,000 rpm. The figures may be a touch lower than the K24A’s 180 PS/222 Nm, but they’re made lower down the rev range, and the EDT engine is cleaner and more fuel efficient. 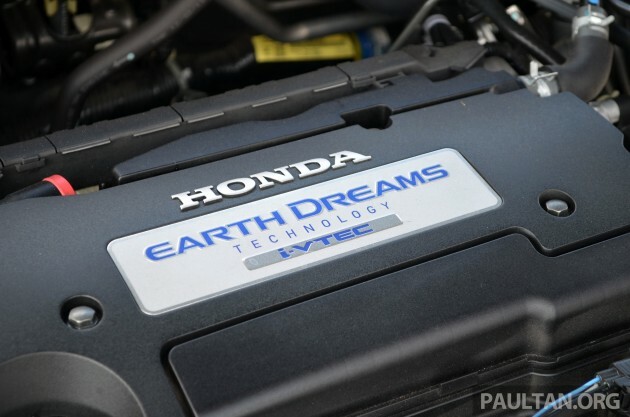 Read more about what Honda’s Earth Dreams Technology is all about here. 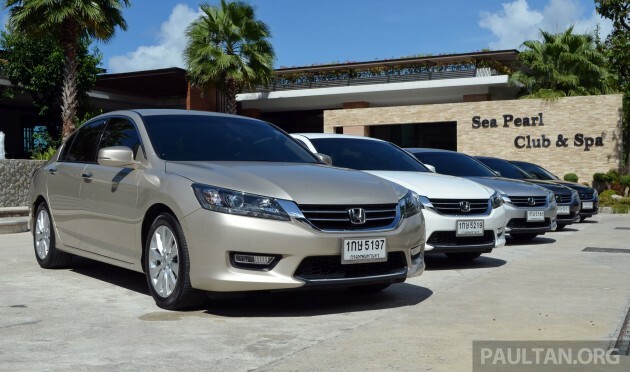 I started the day driving the 2.4 from Phuket to Khao Lak, and found the new Accord to be improved, yet familiar. It didn’t take long for us to notice that there’s less rolling noise than before, one of the few complaints we had about the old car. Less road roar and tyre noise, but rougher local tests such as the well-worn Federal Highway and concrete PLUS highway surfaces await. Incidentally, the new Accord is factory fitted with the new Michelin Primacy 3 ST tyre in Thailand, which we found impressive in a recent test. This won’t be the footwear of choice for locally assembled Accords, which will come with Malaysian-made rubber. The gains in rolling refinement co-exists with an engine that’s typically Honda in character. Ever willing to rev up to the redline, the new EDT engine works with a familiar buzzy mechanical note. Personally, I like the racy sound it makes, even if it’s not hand-in-glove with the executive theme. It’s not unpleasant because we’re talking about character, not strain. Compared to the K-series 2.4 litre, which starts slow before it wakes up with a scream, the EDT offers more low down pull and less of the “two-phase” nature that’s undesirable in a big executive sedan. It’s better, but those looking for the ultimate silent and smooth operator would do better with a Camry 2.5V, in my humble opinion. The five-speed automatic is faultless, as usual. The sporty nature of the engine dovetails nicely with a sharp drive, which is as good as it gets in this segment. I have not tried the new Mazda 6, but like the outgoing Accord, this new one is a great tool for a B-road cross-country drive. The steering is light, quick, and feelsome enough for what it is, the car’s mass is well masked, and there’s good body control to boot. No lurching and rolling around, and ride comfort was good on the 2.4’s 18-inch wheels, on Thai roads. “Drives like a smaller car” may be quite cliche, but true in this case nonetheless. The Koreans may look the part as class athletes, but would do well to match the Honda’s communication and composure when driven hard. The 2.0 litre model is as good to drive, but has to be worked harder. Not that it feels a lot slower than the 2.4 (it doesn’t), but there’s more engine sound in the cabin for sure. The auto ‘box works well, but lacks steering paddles to downshift for corners when driving hard on the twisties, which means I had to pull the lever (straight-line gate, be careful to not miss your station) down to D3 for the same effect, before pushing it up again. More work, but can do. Away from B roads, the Accord is a comfortable car to sit in. From the driver’s seat, our range topping 2.4 “Tech” spec tester felt like a Volvo with Adaptive Cruise Control (mirrors the speed of the car in front), Collision Mitigation Brake System (BRAKE warning on the meter and flashing light when you approach the car in front, fast) and Lane Watch Camera. Lane Watch Camera, the only one from above that will appear in the Malaysian range topper, gives you a view of the left lane when you flick the signal stalk. Captured by a camera below the wing mirror, the visual is displayed on the central eight-inch i-MID colour screen. Only for the left side, LWC can be manually turned on via a button on the light stalk. Very cool, very useful. Speaking of toys, the Malaysian Accord will finally get keyless entry and push start. Other available equipment include a multi-view reverse camera, LED headlamps, LED DRLs and Active Cornering Lamps. Many of these things are appearing in a Honda for the first time in Malaysia. We’ll bring you the full local equipment list and spec breakdown from the launch next week. Compared to the eighth-gen Accord, the new car’s cabin is a massive improvement in both design and functionality. Gone is the expansive, swoopy button-fest dashboard, and in its place is a more conventional layout featuring two colour screens. The smaller of the two is a touch screen for the audio system, while the big one above displays everything else, controlled by the panel on the base of the centre stack. The parking brake is now foot-operated. The ambience is more intimate and luxurious than before, with the colourful displays and 3D multi-layer speedometer adding to the high-tech feel missing in the outgoing car. Perceived quality is good, with soft plastics (the only hard/shiny piece on the top half of the dashboard is a small panel to the left of the steering wheel) and solid controls. Feel aside, the dashboard is more user-friendly now, and the driver’s seat is comfortable over long distances. Compared to the main chair of the old car, the new seat allows one to sit lower to the floor, and the excessive lumbar support I found annoying in the old car has been rectified. The new Accord introduces electric seat adjustment buttons on the side of the passenger seat, close to the driver. Borrowed from the Camry, this is a simple but very thoughtful feature I used frequently when testing the Toyota, one of those things that makes you wonder why all cars don’t have it. Our test unit also had a powered rear sunshade. Its predecessors only had to duel with the Camry, but the new Honda Accord will face stiff competition from all corners when it enters the Malaysian D-segment arena. That said, with new tech, fancy equipment, smooth new looks and great driver appeal, it’s well equipped for the battle, and even a class win. So how many airbag are they giving? Let’s hope its 6. And they give the Collision Mitigation Brake System. If they do, i think that is the end of the Camry in Malaysia. Cause many people who look at the Camry look at the Accord too at the same time. And when they see the tech, you know la. Plus this looks better (not the best-that is the K5 and the 508) than the box like Camry. 2 or 4 airbags depending on spec, no adaptive cruise control, no auto braking in Malaysia. 4 airbags in 2013 in a 180k car…shame on you honda for your double standard. We asians life are not worth the while?The australian market got the whole 6 airbags as standard how come? why not make it an options at least. whats the point of the other safety gizmos when this basic stuff are still flawed. Didn’t the Suprisa-S get a 5? We seem to fail to ask what are the “Active safety equipment” installed? Airbags is after the fact, i.e. your crash it saves you, just like seatbelts. What we should ask what are the Active safety features in the car that reduces/prevents expensive/fatal accidents in the first place? Yes it may not be as exciting as a pyrotechnically deployed balloon, but Active safety like, collision avoidance systems, ESP, lane keeping, Drowsiness detection, Active front lights etc is IMHO just as important as airbags. We should start asking for these safety tech as well not just airbags. The way Malaysians drive and maintain their car, airbags are a must. While active safety is also important, I’ve seen examples of where people don’t understand its limits and still drive recklessly. For example drowsiness detection and lane keeping assistance won’t help if you ignore them or are drunk. SAFETY features should be as “GIVEN” for a car with such price..
nowadays even a car within 80~90K price range equipped with both active and passive SAFETY FEATURES such as 6 airbags, ESC, Traction Control, reactive-headrests, reverse camera, park-assist etc. should be there.. else, look somewhere else..u deserve better guys! My preve is much better than this jap crap. do u mean ancap rating? sure, ur plevey is the best car in ur dream..it’s good to feel proud of what u can afford..
Cant believe some ppl got the ONLY P1 car and think they’r better than the Japan cars lolx don’t siao lah ! HAHA !! ONLY CAN AFFORD A PREVE AR ?? Ini sindrom gaji kecik. Tak mampu pakai kereta mahal. Jadi hanya boleh angkat bakul sendiri. Nice..Proton kena belajar buat design yg matang dan nampak rilek sikit..
Kena belajar bnyk dari Jepun dan Eropah. Mmg usia lebih muda tp apabila ada Jepun dan Eropah sbg benchmark, patutnya dah naik lebih laju. looks wise i can agree with u, but come-on….only 4-star ANCAP for a RM140++ car ? we deserve better man! even the rm80K Sup Rimau aso has more to offer..bugger! What the F is wrong with you people! A car is a package, the safety features does not define a car. And safety features are not defined by the damn airbags alone. You want a safe car go and buy a pick-up. Keep whining and bitching about double standards, about you deserve better. Honda managed to improve the car in almost every way, NVH, FC, Drivetrain, still wanna b!tch. A 140k car then all the safety features must be a given?? This sense of entitlement disgusts me. Hey, does the 2.0 vti version get the double screen or not. Yea, this accord is on par with the Volvo S60 by IIHS’ rating. that’s a big compliment to a car’s safety to be on par with a Volvo. problem is, what they get in USA is not the same Accord as what we get here. they have 6 airbags as standard, but how many here? similarly, we can’t say Preve in Malaysia is 5 star ‘yet’ because we don’t get the 6 airbags variant as tested in ANCAP. So boring. The Optima K5 more advance look than this. Besides the korean car more aggeressive looking. a car is not all about looks. yes optima looks more nice and sharp in terms of design, but accord is not too bad. safety wise if accord have 6 airbags, optima will lose because accord have blind spot camera and few more advance features. This exterior design is going backward. It really looks like old gen of accord. The designers suppose to continue the previous design language and just change a bit. maybe you’re right for exterior,but you’re comparing a turbo with a N/A engine. They’re totally different thing bro. Why already got 2 touch screen panel, but still need separate portable GPS? “it’s well equipped for the battle, and even a class win” Camry still sleeping? Honestly Toyota should really do some ’emergency refresh’ to the new Camry. whan the critcs was out, Honda quickly facelift the Civic within a year. The Camry ain’t doing well; In the US, the Accord already out performs and out-sold its long time rival, looking its sight at the new emerging Korean and American marques. The Camry, or most Toyota for that matter, ain’t ddoing well with the IIHS crash testing. Who cares if Malaysians still want to buy the fugly Camry, T doesn’t have to “beautify” its design, at least for Malaysians. Superb car. Dont know who is going to buy junk like k5 or sonata anymore. This accord looks really good! Are you sure they are junk? Feel sad for you. Please have an open mind to compare the car and price before saying so. IMO, new Accord and Camry look boring, real car could be nicer look. But from the picture, exterior has no feel of excitement. Interior looks nicer than previous gen, drive-drain and NHV should have been improved i believe. The exterior of a 20 year old Accord excites me more than any car that Korean junks have come out with today. That shows you how much the Koreans are lagging behind. Actually, Maserati, I would encourage more to buy kimchis brand new so that my kimchi car yard will make more profit. this car ftis all the purpose..executive, family car, comfort. with the passat wrong gearbox, camry outdated design, mondeo less strong, k5 and sonata just korean, this car is a clear match between mazda 6.
to win the heart of the most, put all sort of gadget and it will be a steal. Just what do you mean by Mondeo less strong? And don’t forget Mondeo. But problem is Aston Martin wannabe, if remove the Blue Oval logo, it will be another Chinese rip off car. Mondeo or Fusion in the US shares some Aston Martin features because Ford OWNS AM and it was intentional that AM features are incorporated into the Fusion/Mondeo the same way that Lexus features get incorporated into the Toyota Camry. AM wannabe, you betcha and Ford Mondeo owners should be proud. Honestly, FrenzyAustin, go do some research including test drive. You comments are not based on facts. In my opinion, the Mondeo is an awesome car. Ford Malaysia need to work on the pricing and bring up the volume. Ford has done a great job with the Fiesta and we can see quite a number of Focus (Foci?) on the road after nearly 1 year of it being launched in this market. By the way Frenzy, Mondeo is consistently rated top 3 in most reviews in the US for family cars. Which sentence I said Mondeo is bad? I know it’s good in every way but Aston Wannabe grill is unforgivable to me. Why world fifth largest car manufacture want to do something so shameful and stupid and it’s not like Ford has any of this grill before. Focus and Kuga grill is much better and sporty, new grill is pathetic. Instead of being given the answer, maybe you may want to clarify what you intend to communicate to other by the phrase: “if remove the Blue Oval logo, it will be another Chinese rip off car.” as Chinese rip off can mean many things. In terms of safety features this car is far behind the competitors, except for the Camry. My Mondeo met a Accord 2.4 in North South Highway yesterday, it could’t even touch my smoke..only the Passat could hardly catch up.. I tapaued all with my old wira turbo 400whp, apa cer? tapau all maybe i can belib u…but how long can u maintain cruising pass 200km/h with ur wiraturbo? with all the wind/ cabin noise from ur old car…get what i mean? This car looks clean and elegant. you mean it looks boring and midlife crisis? A sort of unrelated question. Foot handbrake is fine if paired with Auto. No Hill-hold assist is fine. What about countries which have manual transmission? Is there a hill-hold assist? Cannot park this on inclining road and need to manage brake, handbrake, throttle and steering at the same time. It looks like the handbrake removal was an afterthought? I see a hole next to the drinks area? Trying to convince those in the 50s+ to change their current Accord to something that looks similar is going to be hard. They don’t care about the toys that much. Especially since the new car looks a lot like the old car. Sound promising from the improvement over previous gen.. About the improved ambient noise, hopes Paultan crews to give a clear facts rather then just feels on the improved noise insulation. Most of the time media should use how many dBs improved among its rivals or over previous generation.. It featured Active Noise Cancellation, means it produce a sound wave through speaker to cancel the unwanted noise in cabin, like what they use in a flight. Same speakers that used by audio system or a different installed speakers? Unlike the previous gen, this new generation rear design is so pleasant to look at..
Its a relly good car but like most Hondas in Malaysis is only 2 airbags away from perfect. Anyways, equipment, specs and IMO, looks to go toe to toe with the new and improved boys. and is nice to know that the NVH, a significant weak point in an Accord or any Honda for that matter, has been improved. Put it in other words, it’s a significant improvement over the old model, unlike its smaller bro the FB Civic. and just because it dosen’t have the curvy lines of newer cars but regains its traditional outlooks and a familiar badge dosen’t mean its a awful car. Thai made model already has range topping 6 airbags, but Buatan Malaysia is clearly behind the league. Isn’t Honda won’t care about our safety, but our own company (DRB-Hicom) rip us out to profit themselves. Yeah its really a shame, looks aside, Honda is praised as one of the brands that excels in safety for a low end car in the USA. Most of their cars are already IIHS top pick. It’s just DRB, and maybe because they are trying to give some favorable sales boost to their newest ccollection, Proton, I really don’t see why, its only 2 airbags short in the top spec, matter of fact, in almost all Honda cars. 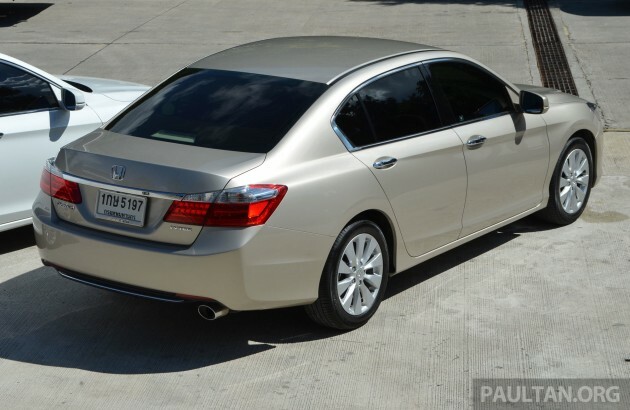 Honda made improvement with the Accord, looks aside, its better than the last in almost all respect, but sigh….DRB. But it wasn’t a surprise, remember the Honda Jazz Hybrid CKD. I wonder uncles will think again to buy because it’s like recycled design from the past. Looking at the past comments you must really hate Volkswagen or something. To be honest, in America, VW drivers have a mindset of acheiving an ‘Holier than thou’ attitude don’t know why along with Toyota Prius drivers and BMW drivers, and over here, its the cheapest way to achieve German perfection…..and as far as the comment goes, some people are determine that it is the only choice if you got the money, and to be fair, a German car for the price of an Accord sounds like a very sweet deal. But in the end. Because VW is boring, overrated and overpriced. German perfection failed when DSG can’t work in a hot country? VW tends to fail a lot in SEA and also Australia. Their car is boring to look at, interior is so so but price is sky rocketing high but still people go crazy for it because “German” makes you cool. Currently, there is NO exciting model from VW brand, Focus ST drive better than a Golf GTi, Evo X and WRX STi is better driver car compare to Golf R. At least the most hated car company launched some very exciting model such as GT86, upcoming Supra and over-engineered super mini, Yaris Hybrid R.
seriously? EVO X & WRX STI better driver than Golf R? Sure can tapau Camry easily……good work Honda! …simple and safe… sure H already knew their target customers … for late 40’s and 50’s i think…my current uni t had a problem with windy noise inside the cabin since first month when i bought it ten yrs ago, till now the sc can’t detect why! Looks better then current version. But Camry sports a more classy look especially the black ones. Anyway, Camry outselling this model in the USA. I would be most grateful if you could kindly advise if airbags need any maintenance? Overall look goes back to 6th Gen especially front, rear and height. And this car is a sure winner in dashboard LCD count. But wait until journalists road test when results normally gave better mark for the uncle T, spirited handling to mr M and mr N for alternative choice. This accord looks somewhat american.. No wonder the looks remains the same for worldwide market. Would be nice if honda offers both UK accord n US accord here in malaysia. To me, UK accord is kinda small, but looks sportier than the civic.. But too bad, only japan gets both accords as inspire n accord. You mean Accord Euro? And new generation of Accord Euro is currently under development and won’t be weird if it suddenly appear in Frankfurt Motor Show. Weirdly though, I prefer more exciting Honda Inspire than more conservative Accord Euro. Pl get Hafiz to review the car. I need more info to decide whether to buy the new model. reminiscent of Accord CG (6th Gen)…must be hired same designer or his son..
8th generation front double wish bone vs 9th generation mcpherson trust? A boring car for boring people. I consumers got out of their ‘Honda’ and ‘Toyota’ mentality, they would see that there are much better options available in this range. Cue the lemmings who will now vehemently stand by their brand. One thing about DRLs, are every car on the road copying the Germans? Since when they intro DRLs in Japs and Koreans. I believe the originals are that of Beemers, VWs and Audis. The rest are copycats. Worst are those Wajas with self modified DRLs installed. Also I noticed the new Accord had no handbrake lever? Again, this must be copying the Passats. the new Accord side view, see carefully, and u notice it does look like the Passat B7. How much is the 2.4L selling? RM190k? Don’t waste your money. Get the Passat Sportline. Why? Cos it’s the original while the rest are copycats. U can never beat the handling and ride feel of a Conti car. Thr Passat definitely feels more involved and the 18 incher comes with CSC 5 Conti seal tires, while u get Sime Tyres on your Melaka CKD Accords. The Passat is definitely a smarter car with all it’s safety features and driver assist functions. I can only say this, the driving feel of it, Accord and the rest definitely loses. Sufficient horsepower with early kicked-in Torque is the thrill u won’t find in the Accord, Camry, Teana, Sonatas. I would rather buy the 508s of this French world. seriously it’s the ride and handling and THE torque. DRL started on Audis, the Koreans start popularizing it and made it mainstream, now almost every car on the road has DRL. I heard somewhere that is an EU safety implementation, not sure about that. Porsche invented Hybrid in late 1800’s, yet after 100 years when Toyota successfully selling Hybrid to mainstream market, VeeDud copy them by making a Jetta Hybrid, A6 Hybrid and XL1. Veedud should stick to their rattling diesel engine and don’t follow what the Japanese doing. 1800’s? I think you meant 1980s. Early 1900…actually 1900 itself, Ferdinand Porsche and some other guy came up with the ‘Mixte’. The thing actually works like an REEV because only the motors is powering the wheels, gas engine is there to only power the generators. Porsche spearheaded the idea so much so that when war came he came out with a tank for the Germans that ran with this powertrain, the ‘Ferdinand’. But at that time batteries were heavy and low tech, and Porsche’s hybrids were heavy, offers lower performance, were maintenance-intensive and they were even bigger fuel guzzelers than their petrol counterparts. The idea didn’t pick up until the 1980s Audi Duo concept and the Toyota Prius. DRL… Hmmm… In the late 70’s, Volvos (240’s, I believe) already had their headlights on during the day for safety. You have an option to turn them off but Volvos then were running around with lights on. My guess that most readers here are not even born when DRL started. Scandinavian countries have been making DRLs mandatory due to thier climate and weather location. Even cars with no dedicated DRLs had an additional module/relay that ran the highbeams at lower voltage during the day. Alternatively these countries also mandated side market lamps as position lamps both front and rear. once drive on turbo,i think i wont go back to NA. It speaks volume of how bad Hondas’ design is that most readers mistake this car for a facelift! These Japs are just contented with what they have and they plan to continue short changing their loyal customers with these obsolete designs. Honda fans, please wake up and start looking at other makes that are much better in all aspects such as the Passat, Mondeo and even the Koreans. Don’t belayed a fool and buy museum pieces! Cheers. I predict this to be a seller, yes, it will sell well. Pleasing to the eyes of uncles and aunties who have enjoyed good capital appreciation on their investments in property, they will go for something with RV and easy to let go in case they need some cash for the next investment. Most important of all, parts must be cheap. European car cannot lah, made for cold countries only. Let see how much will they be priced at, if the spec/price concept still similar to current gen, then not much surprise. If you have budget of 140k, i think you know which one to go for. looks good and handsome as usual for a Honda… Camry design can really saupei dy..
the look is cleaner. the last accord is a little bit messy with the look. this one improve in terms of the direction of the design, looking simple but yet elegant. my father loves it… he said so. Your father like? I am beginning to see the trend. This kind of comment is really irritating. You seem to think just becos a car doesn’t have swooping lines its for uncles and aunties? What is wrong with uncles and aunties? A lot of them are car enthusiast! I assume you are a young fella and a car enthusiast since you read paultan …… say its 20yrs later and you are officially an UNCLE/AUNTY, so will your car be ugly, boring and your brain no longer function in deciding what car to buy and you become totally ignorant when you choose to buy a car? You are missing out the whole discussion. And you do not know my age as well. Simply put, Accord which has a strong following of people who associated the model with sportiness and a younger image are clearly disappointed with the shift. Accord has gone from being a sporty sedan to one that is sedate, tame and clearly aimed at a more mature target segment. Not sure if this is intentional but to compare, look at the commercials in Australia and Thailand: what is your conclusion. Compare that to say the Peugeot 508 ad. That is what we are talking about. You are terribly naive to thing that Uncles and Aunties are ignorant about what they want. If you have have a foot in marketing, you will know that they want RV, airbag not important, must not look too garang and spare parts must not be too expensive. More importantly, cannot be too high tech for 2 reasons: don’t know how to operate and easy to spoil [sic]. Don’t pick examples of “professional” uncles/aunties, they are the demographic minorities. So, the “sheesh” may be premature. Do your homework. Hi Colin – On the accords, – they have shifted from sporty quite a few generations ago. its now a family sedan with a touch of sportiness. they don’t even do type r now – quite sad actually. the 7th and 8th gen – sporty? actually the 9th gen seems to be moving back to its roots compared to the 8th. have not driven one so do not know yet. On your comments. I think you got it wrong that i think uncles and aunties are ignorant. actually i am trying to point out on why they are perceived to be that. maybe i wasn’t clear. the uncles and aunties in their 40s and 50s some are pretty tech savvy and know their cars. there is absolutely nothing wrong to consider the RV of cars, cost of maintenance (FYI that is actually smart thing to do) and most do take note of safety becos they have family to consider (why do you think reliability is crucial? your car may have 7 airbags and 5star rating but if it constantly breaking down in the middle of nowhere that is hardly safe). What do you mean professional are a minority? i can also conclude that the youngsters nowadays do not understand much about cars too as most of them myvis, vios, altis…..
U r a typical Malaysian car buyer. T&H is ur religion. Full stop. taiwan spec…… 2.4 , cvt. 188 hp & more, full US SPEC…….here we r getting diffrent spec . Better design than outgoing model, especially rear tail light, simply elegant. If would be better if the price could be brought down lower, or maybe local assemble here, like Honda Jazz? @Danny, is there something wrong with this sentence? I hav no prob understand. The sentence is saying: Korean cars look sporty, but cannot yet match Honda’s driving feedback and handling at higher speeds. Cleaner and sleeker design inside and out, yet it spells Accord in every angle. Respectable amount of gadgets, appropriate use of LEDs in the rear and front makes it looks up to date. Coupled with the good reliability and resale value, it will sell well in Malaysia. Not to say its the default choice to go to, but it will certainly be competitive in the D segment market. On another note, D segment in Malaysia caters for mid 30’s to 40’s. While being sporty and have the urge to speed, they also appreciate a touch of elegance in their daily ride. Achieving this balance is rather tricky for car manufacturer. Why the US accord 2.4 EDT is mated to a cvt, producing more hp (185) and torque (246) , izzit because the quality of fuel? Or the ommission of direct injection? Why ours still mated to the old 5 speeder? Man, this is great news for me, as there will me more Sonata/K5 trade ins happening for me. I like your joke very much. Without you Sam, Paul Tan.org is gonna be bored! i think it is one of the few honda’s that gets LED brake lights pre-facelift. last gen accord don’t even have any, both pre- and post facelift models. like the cleaner and simpler look, a bit like going back to how accord used to look like. R u sure this is an ALL-NEW model and NOT a facelift? Yep. New model > facelift > slightly modified and branded as new > facelift > actual new model. Guess where in the cycle we are. Hmm…looks like Honda is following the VW strategy to keep the DNA of its Accord design. Though the new look is not bad at all, the million dollar question is, will the 2.0 variant gets the VSC, I cannot imagine if it’ll come without, when even the Jazz gets it as standard equipment…let see. It’s very difficult to change most of the malaysian car buyer mindset to accept kimchi, too used to sushi regardless of lower spec yet with high price, but japs will learn, can see that their models are better spec-ed now as there is threat except Toyota. vios is a 1.5l car while the K5 is a 2.0l car. Of course a smaller displacement car will be better in fuel consumption. Pls compare the 11.5km/l fc with other 2.0l models. In the US the ninth-generation Accord offers three powertrains: A new direct injected “Earth Dreams” 2.4-liter 16-valve DOHC four-cylinder engine rated at 185 hp (138 kW) to 181 lb·ft (245 N·m) of torque paired with either a six-speed manual or continuously variable transmission(cvt). Why in Malaysia and Asia version 2.4 Earth Dreams Engine is 175hp and 225NM torque?? Honda Malaysia please equip Malaysia Accords as US version as it come with standard an 8-inch 480 x 320 pixel WQVGA resolution LCD display screen, single angle backup camera, Honda’s i-MID system which includes Bluetooth hands free calling with SMS texting and streaming audio, USB connector, dual zone automatic climate control and alloy wheels. The available navigation system adds a 6-inch touchscreen and the 8-inch screen uses a higher 800 x 480 pixel resolution WVGA display. A tri-angle (normal, wide and top view) backup camera and wide angle passenger blind spot side view camera are also available. New safety features include an optional forward collision warning system, lane departure warning system and blind spot monitor. Highline models (EX, EX-L, and Touring grades) offer Smart Key, LED daytime running lamps, headlamps, and tail lamps; and an adaptive cruise control system. last time when replacing the SM4 with SV4, the design gap look hugely apart, CF4 which replacing SV4 somehow really look like replacing SM4 design instead of SV4. Now this 9th gen just nice to replace the CF4 in term of design and the 8th gen was just an alien. Seems like they are unloading the new accord at the sg long honda showroom now!!!! The front and back are taped. I’m alright with most of proton exterior design but not with interior. I think Proton should send their designers for more interior training/ awareness/ convention. Buy hybrid/ small displacement turbo car, fuel car increasing today. 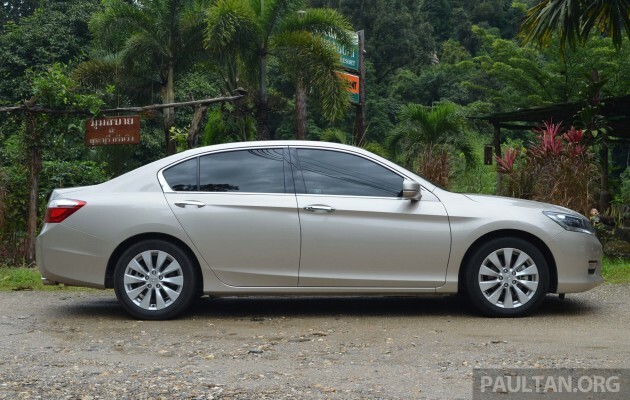 and upgrade from the 7th gen accord rear, and simillar with the camry….nothing Boombastic factor accept of interior…waiting for the next sonata..
And I am waiting for you to sell your rotten cabbage 1 year later. Many Sonata/K5 owners feel so much happier and proud after trading in their rotten cabbages and switching to a much smaller Jap car. I would encourage more sorhais to buy kimchis new, so that when they trade it in, I make money. Honda accord is well known for the noise cabin and sluggishness. Based on the review , i would say it’s still sluggish esoecially the 2.0. Sluggish car is boring and imagine driving in the city , traffic light , roundabout and slopes n hills. I still dont understand why can’t they make a smooth pickup car. no point having so many functional buttons but your car is sluggish. It’s like old woman with lots of makeups but cant do much in ………! Went to see the Accords in the flesh. My opinion about it being the choice of RV fans is finally confirmed. The quality is lagging behind Euro makes. The read window screen was flimsy and the reinforcement rib was a joke. The buttons look like they are made in China. Don’t believe, please go but wait, drop by VW and Peugeot first. Get a feel of the quality. The doors feel light (is that another reason why 4 stars only?) Anyway I walked away unperturbed by the sales agents remark that my 508 won’t fetch good price after 5 years. For goodness sake, don’t get a D segment in Malaysia if one is forever obsesses with RV. Then what is the motivation for an Accord? Space, get an Innova, performance, get a Euro car, looks, common, current gen Accord unless you are 40 plus, safety, you give hit your head against the tree or TNB pole and may never regain consciousness to lodge a complaint (where are the curtain airbags!) So the only thing I can think of are, one, loyalty, I can understand. Otherwise, I don’t see a reason why this Accord. Don’t be short changed. Shop around. Unless and until Honda blinks and treat us as respectable consumers who can think, walk away. Getting 4 stars in ANCAP and then stripping away 2 critical airbags is an affront to customer intelligence. Pug 508 hybrid4 is going to be launch soon..if wanna trade in with 2012 pug 508 is the RV okay?.. suitable for people with very strong normal taste..
currently what car are you driving? hahaha i’m driving a 2007 CRV now. Planning to trade in either mazda 6 or this new accord. The reason why i put these 2 cars in my list because of the design of mazda 6 and i’m kind like honda fan boy hahaha. As for honda, the 2.0litre version has the same engine and transmission from the previous generation of accord while the mazda 6 is completely new with all the skyactive technology in it. So i’m still in doubt about the reliability. And 1 thing for sure i dont care about what resale value blah blah blah. Car is not an investment. Well, looks like it is going to be either Mazda 6 or CRV 2.4. Mazda 6 is RM154K OTR while CRV 2.4 is RM170K. I then strongly recommend you to have a look at the 508 as well. Went to both mazda and honda showroom today. To bad they dont have test drive unit for Accord yet. Here is my opinion. Exterior wise, mazda 6 have that aggresive look that wont get bored after years OTR while Accord is a little boring but not too bad. Interior wise i prefer the Accord. Accord have that kind of luxury feel especially the dashboard and the steering wheel design. I dont like the mazda 6 steering feeling. It is like the diameter is too small and i hardly find any grip and that kind of sporty feel. I dont know how to say but it just feel weird to me. The leather surface is to slippery. Will wait until next week test drive the accord then only make decision. OMG out look like 06-09 hyundai sonata. no honda feel. Accord or Camry is same no value for japanese people. japanese prefer higher spec like toyota crown majesta,mark x and for honda accord tourer or hybrid. No market for this model in Japan.Only in Malaysia people are so proud when drive japanese even they give low spec to customer with high price. same as VW passat in germany. I give comment base on my experience stay in Japan and visit German for automotive parts development. Support our product doesnt mean support politic leader.because honda also under goverment share. ONLY TO SAY SUPPORT OUR COUNTRY. this is an excellent car. Lot of thoughts have gone into the manufacturing. I bought the new 2.4 Accord last November. I have been a Honda man from the year1982 with my first Honda Civic 2nd Gen. The new Honda Accord is my 5th Honda Accord I have owned. This model is the worst of all the earlier models I have owned. Just sold the car which is 3 months old. I am really disappointed with this model. Extra fancy gaggets does not make a good car. It feels very light and especially on the highway. Petrol consumption on the earlier model was better and you feel more confident driving the earlier model than this new model. I am Honda fan since 8 years ago when I have Honda City Vtec and then last years I bought CRV and last month just get my Accord. Was so thrill after reading all the reviews and unfortunately, I felt disappointed. CRV do not have alarm and reverse sensor warning sound, that I have to be extra careful while reverse, but 2014 came with reverse censor warning. Now, Accord came with GPS and what is the use of GPS when you not even to get to the address entered?? Called customer service and only found out that they only have solutions to update by September. I thought the well-known and reputable Honda company will ensure Accord came with useable features that paid for. Now, only I know the GPS is for display only. Sirius XM Satellite Radio as found in the US.